My dear friend J and I used to make this in high school on the reg, from her grandmother's recipe. I got her to send me the recipe over the holidays, and made this for Christmas morning snacking. I might make it for Easter morning as well- D is a coffee cake FIEND (and a total product of his mom's amazing baking), and since he'll be with us in Boston, I know this will get devoured. 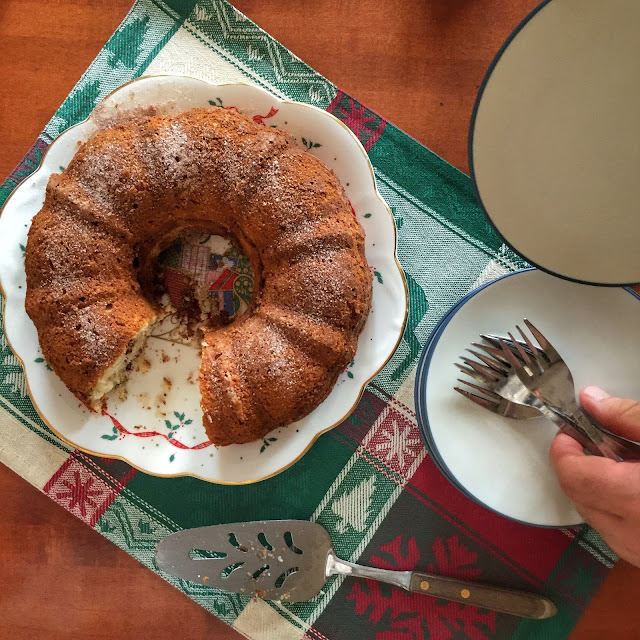 It's the best coffee cake recipe I've ever had, personally. I've copied the recipe for you below in it's exact iteration, but know that I cut the sugar down a LOT, but don't skimp on the cinnamon! In a separate bowl, mix 3/4 C sugar, 1/2 C nuts (if desired), 1 T cinnamon. Pour half the batter into a greased and floured bundt pan and sprinkle with half the sugar mixture. Pour in the remaining batter and sprinkle with the remaining sugar mixture. Bake at 350 for 50-60 min. EAT.